1. A reference to a politely pleasant and friendly relationship: Germany and the United States have maintained cordial relations since World War II. 2.Relating to someone who is radiating warmth and friendliness; genial: The people who attended Mike's birthday party received cordial greetings from him when they arrived. 3. 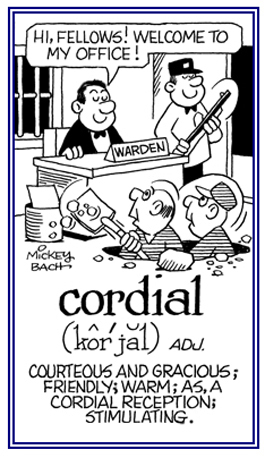 Etymology: from Latin cor-, cord-, "heart". © ALL rights are reserved. 1. Operative fixation of any displaced anatomical cord. 2. Lateral fixation of one or both vocal cords to correct glottic stenosis (the narrowing of the vocal cords and the opening between them). 1. Strife, tension, or without agreement among people, or groups. 2. Harsh or confusing because of a bad intermingling of sounds. 1. The lack of agreement or harmony by people or groups of people. 2. In music, a combination of inharmonious sounds or tones. 1. Conflicting or disagreeable and not getting along with each other: "The discordant views of Fred Brown, and his son Luis, resulted in many arguments between them." 2. Harsh or unpleasant sounds: "The students were playing discordant music at the beginning of the semester and then, later in the school year, they were much more harmonious." Showing page 2 out of 4 pages of 47 main-word entries or main-word-entry groups.